How much does energy efficiency cost? The U.S. Department of Energy estimates that the typical household can save 25% on utility bills with energy efficiency measures, which amounts to over $2,200 annually. Although energy efficiency is often the more expensive option in the short term when compared with conventional alternatives, utility bill savings over the life of the efficient product can fully offset the initial cost premium and yield an implicit return on investment for homeowners. With the nominal prices of household site fuels only projected to rise over the next couple decades due to increasing production costs, this makes an even stronger case for an investment in energy efficiency today. There are a variety of energy efficient upgrades you can make in your home, ranging from simply replacing your light bulbs to more intensive projects like sealing air leaks and replacing windows. Energy efficiency is known to be a cost-effective investment, but the actual amount of savings differs based on the upgrade in question. Gross energy savings are positively correlated with the cost and difficulty of the upgrade, which means that more extensive home renovations will result in greater savings over time. Furthermore, a combination of compatible upgrades in a “whole-house” approach will earn disproportionately greater savings relative to their total initial cost. In fact, the Department of Energy estimates that you can potentially reduce your utility bills by up to 30% through multiple energy efficient improvements in interior temperature regulation. Replacing old bulbs with energy efficient alternatives is one of the easiest methods in reducing your utility bills. However, lighting is only 9% of the average energy budget, and the resultant savings are not as impressive when compared to other energy efficiency measures. Still, compact fluorescent lamps (CFLs) and light-emitting diodes (LEDs) use 65 to 80% less energy, and last 10 and 25 times longer than traditional incandescent bulbs, respectively. Energy saving halogen incandescent light bulbs use 25% less energy and last up to three times longer than a standard incandescent bulb. LED lights are the most expensive option at $8 on average, which is eight times the cost of a traditional incandescent bulb. Given an average annual utility bill of $2,200, the estimated energy savings of 75-80% per 12 watt LED bulb can result in $22 to $27.50 shaved off your utility bills within a year. When the annual savings and longer life of efficient bulbs are accounted for, energy efficient bulbs are the clear winners in both the environmental and financial sense. If the mercury content in CFL bulbs is a concern, a study published in Environmental Engineering Science has found that it would take weeks for an unattended broken CFL bulb to release enough mercury into the air to potentially harm children. What is an energy efficient appliance? In an average home, appliances are responsible for about 16% of total residential energy consumption. Household appliances have two prices: the purchase price and operating cost of the appliance. To find the true cost of an appliance over its lifetime, multiply the monthly operational cost by the lifespan of the product, and add the resultant amount to the purchase price. Although energy efficient appliances have higher purchase prices, they can still be the cheaper option in the long run because of their lower operating costs. 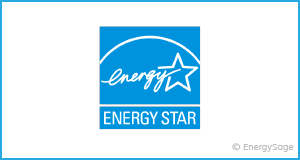 When purchasing household appliances, you should look for the ENERGY STAR certification. Appliances that are ENERGY STAR certified will consume less energy during active use and when on standby than comparable conventional products. Common household appliances that have ENERGY STAR labels are refrigerators, clothes washers and driers, and dishwashers. Actual savings depend on the service lives and energy saving rates offered by energy efficient alternatives, which differ based on the specific appliance. Clothes dryers are the most energy intensive appliances in the household, using 25% of total energy consumption by standard household appliances. ENERGY STAR certified dryers consume 20% less energy than conventional clothes dryers, and can offer $210 in savings on average over its entire service life. Refrigerators and clothes washers are also high on the list of energy consumption, each amounting to about 28% of appliance energy use. ENERGY STAR refrigerators use 9% less energy, and efficient clothes washers use 25% less energy and 45% less water compared to standard models. Dishwashers constitute 13% of standard appliance energy use, which can mainly be decreased through water use reductions. With efficient dishwashers, you can save water and have cleaner dishes due to the soil sensors, innovative dish rack designs, and other beneficial features of ENERGY STAR models. Water heaters last 10 to 15 years on average, giving energy efficient water heaters a considerable timespan to generate savings relative to cheaper, conventional models. If you are looking to replace your water heater, you should keep in mind the type of water heater that will meet your needs as well as the type of fuel it would use. For example, tankless water heaters are unable to handle simultaneous multiple uses of hot water, making them a poor choice for large families. Tankless coil and indirect water heaters are often an inefficient option for homes, but especially for those located in warmer climates. If you are looking for more information, the U.S. Department of Energy offers a comprehensive overview of all the factors you should take into account when purchasing a new water heater. Windows are among the most attractive features of any home, but are responsible for a significant amount of energy waste. Ten to 25% of your heating bill is the result of heat loss through your windows, which amounts to $91.30 to $228.25 you could have saved on your annual energy expenditures. If you are looking to cut back on your unnecessary heating costs, you could replace single-pane windows with double-pane windows. For homes in colder climates, gas-filled windows with low emissivity (low-E) coatings can significantly reduce heat loss. On the other hand, households in hotter climates should purchase windows with spectrally selective coatings to reduce heat gain. Low-E coatings may also reduce heat gain due to their reflective nature, making them viable options for keeping heat in during the winter, and out during the summer. Window curtains can also play an important role in reducing unwanted heat loss or gain by providing an extra layer of insulation between your home interior and the conditions outside. Storm windows are another option for minimizing heating or cooling expenses, and have the additional benefit of protecting your home during extreme weather events. The U.S. Department of Energy estimates that you can save about 30% on your utility bills through a combination of upgrading your HVAC system, properly air-sealing and insulating your home, and controlling interior temperatures with a programmable thermostat. 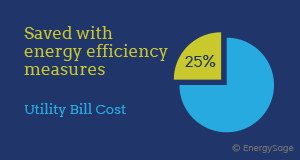 Heating and cooling expenses make up 47.7% of residential energy use, and thus have the most potential for utility bill savings. 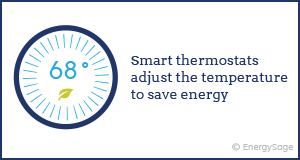 These expenses can be slightly reduced through programmable thermostats, which optimize temperature use within your home. You can set your programmable thermostat to heat and cool your home at certain times, and turn off heating and cooling systems when you’re away. However, a programmable thermostat by itself does not address the root cause of your high utility bills. Heating and cooling expenses are heavily dependent on average regional temperatures. There are significant regional differences in energy expenditures across the U.S. as a result of differences in climate conditions, particularly between the West Coast and Northeast regions. As a result, households in regions with more extreme temperatures can receive greater benefits from heating, ventilation, and air conditioning (HVAC) related upgrades. In addition, it will take more energy to maintain interior temperatures at any given level if your home is not properly air-sealed or insulated. Because your home interior is more exposed to external temperatures, it will take more energy to heat your home in the winter and to cool your home in the summer. How much of an impact does proper insulation have on your energy costs? Consider this: homes built before 1950 that have an insufficient amount of insulation use 60% more energy per square foot than those built after 2000. With average heating and cooling expenses of $1,049, this translates to an annual utility bill that is about $630 higher compared to homes with sufficient insulation. Even with the upper average cost for insulation projects of $3,000, you can start to see real savings in just five years. The same concerns regarding air leaks and proper insulation should also be addressed for air ducts, which can reduce your heating and cooling bills by 20%.